Preheat the oven to 450°. In a small bowl, whisk 1/4 cup of the olive oil with the rosemary, mint and garlic. Season the lamb all over with salt and pepper. Rub half of the herb oil all over the inside of the lamb, then roll up the meat and tie with kitchen string to form a neat roast. Spread the remaining herb oil all over the roast and set it on a rimmed baking sheet. Roast the lamb for about 15 minutes, until just starting to brown. Reduce the oven temperature to 375° and roast the lamb for about 1 hour longer, until an instant-read thermometer inserted in the thickest part registers 130° for rare meat. 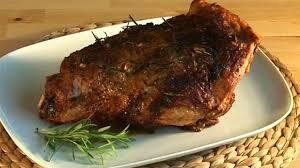 Transfer the lamb to a carving board and let rest for 30 minutes. Meanwhile, in a medium saucepan, heat the remaining 2 tablespoons of olive oil until shimmering. Add the shallots, dates, honey and a pinch of salt and cook over moderate heat, stirring occasionally, until the shallots are softened, about 7 minutes. Add the vinegar and cook, stirring occasionally, until most of the liquid has evaporated and the jam is thick, 3 to 5 minutes; season with salt and let cool.